If you've not yet read the first book then stop reading this review. Right now. As spoilers for the first book are ahead, there is no other way to talk about Evermore without delving into THAT revelation in Everless. You are warned. Evermore picks up straight away from where Everless left us hanging, desperate for more. Roan and the Queen have been killed by Caro (or the Sorcerer as we discovered she truly is) while our protagonist Jules, the latest and final incarnation of the Sorcerer's enemy the Alchemist, is blamed for their murders. While on the run, Jules is trying to reconnect to her past lives, filling in the mental blanks in her own story to discover the key to defeating the Sorcerer once and for all. But with Caro having discovered Jules' true identity no one close to Jules is safe so she tries to distance herself from her reluctant ally Liam and her twin Ina, who is stepping in the death Queen's shoes. With Evermore being the concluding chapter in the Sempera duology, there was a lot to get through, making the start and ending of the novel particularly action-packed and fast-paced. Yet despite the enormous amount of storyline development, the middle of this sequel and the newly introduced characters felt somewhat underdevelopment. This wasn't the case the whole way through but there was certainly a midway lull. For the most part though, this was a sequel very worthy of the magical original. Expanding upon the remarkable world-building set up in Everless and going in all sorts of exciting and new directions before a very satisfactory, if somewhat speculative, ending. When I interviewed author Sara Holland last year she teased what would be in store for Jules, including that we'd be seeing Liam's school and learn about his background, and it was brilliant to see this Gerling brother more front and centre. I didn't think I would love him as much as I did, but he was the surprising 'breakout star' of the sequel. The introduction to the kingdom of Sempera where blood is a precious currency in Everless was very cool and interesting, and I was craving more from this world as soon as I had turned that final explosive page. More about Jules and Caro, more about the origins of the blood magic, more time to focus on Liam and Ina, more answers about the Sorcerer and the Alchemist... and Evermore definitely delivered on its titular promise of giving us more. Much more. Sara Holland has created another adventurous tale from her incredible imagination filled with jaw-dropping revelations, magic and mayhem, and a delicious dose of romance too. 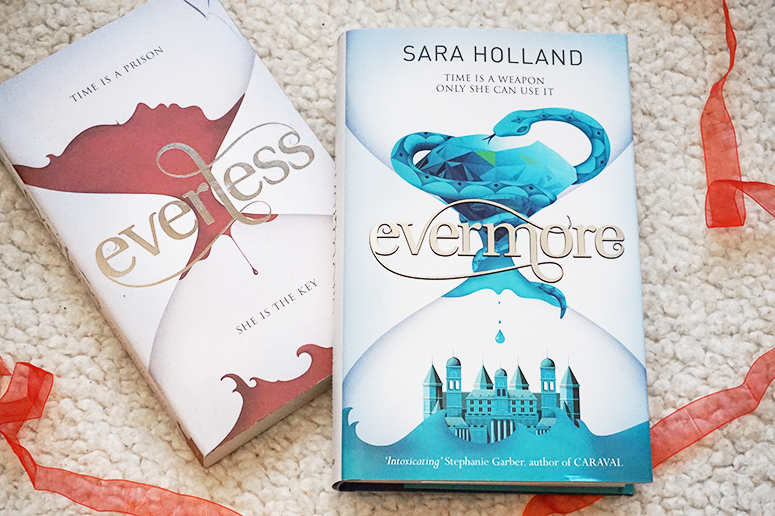 I loved it, Evermore has given us a great conclusion to the brilliant Everless. Evermore is published by Orchard and you can get your copy now from Foyles or your own preferred retailer.